LEN - www.lankaenews.com | To the dismay of all it is president himself as head of cabinet who told to boycott cabinet meeting on 10 th ! To the dismay of all it is president himself as head of cabinet who told to boycott cabinet meeting on 10 th ! (Lanka-e-News - 10.April.2018, 5.45PM) During the meeting of the SLFP Central Committee on the 9 th to decide whether the SLFP should boycott the cabinet meeting of the consensual government scheduled for today (10) , nobody present proposed that the cabinet meeting shall be boycotted. 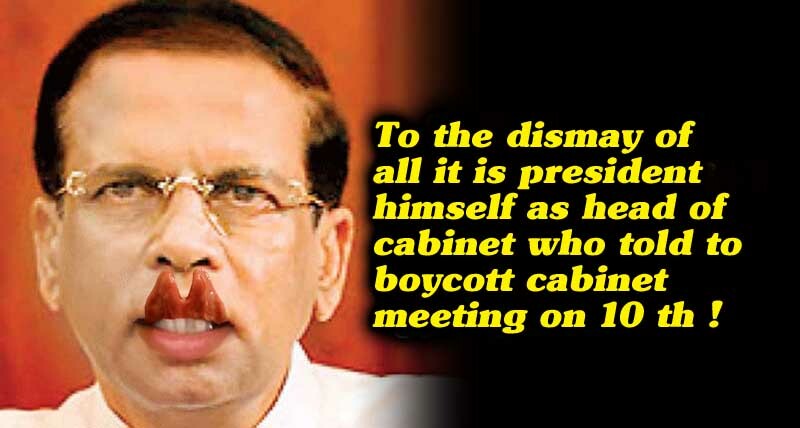 Yet to the consternation of all it is the chief of the cabinet – that is no less a person than the president himself who had told to boycott the cabinet meeting , according to an SLFP spokesman who made this revelation after LeN posted the earlier report. We reported SLFP will boycott today’s cabinet meeting , and that was the decision taken by those who attended the Central Committee meeting. However according to the SLFP spokesman who contacted us , pointed out that report of ours is erroneous . The boycott today is in accordance with this instruction. In the circumstances , no minister who supported the no confidence motion had ever told, the cabinet meeting tomorrow shall be boycotted. Yet , the SLFP has still not decided on whether they should cling on to the cabinet posts of the consensual government or not? And ,are those who kept away without voting during the no confidence motion to stay put in the cabinet ,and only other ministers are to go? These questions were left unanswered and the meeting was postponed. It is well to recall president Gamarala recently at the meeting with the participation of the P.M. and senior UNF ministers in a fit of uncontrollable rage exclaimed ‘ If I am to go I shall set fire to everything before I go’ which crude behavior was considered by one and all as most unbecoming to a president of a country .